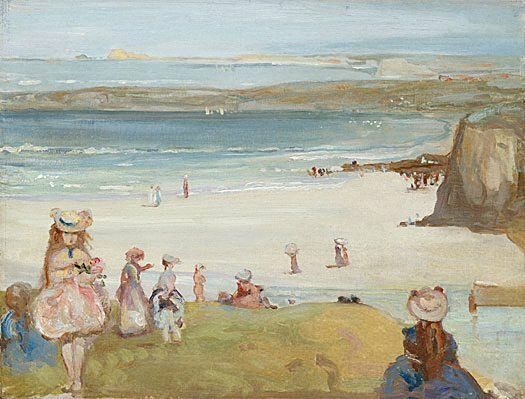 In August 1906, Charles Conder travelled to Newquay on the Cornish coast. He had spent the previous two months at Whitehall Sanatorium recovering from a stroke, and hoped that the sea air and rest would enable him to begin painting again. Conder produced drawings and small oils of the beach and cliffs at Newquay. He wrote to his friend William Rothenstein, ‘there is a most lovely beach and one sees such charming sights of a kind of strange picturesque people who are always on the beach’. Amongst the last of Conder’s paintings, these works recall his happy years in Australia, where he painted the beaches at Coogee, Bronte and Sandringham.